Now you can Soup Up your standard Telecaster (or similar guitar) to get more pickup tone power and also increase your creativity and versatility additional fresh new pickup tones. Your stock Telecaster is designed to give you a modest and inadequate 3 pickup tones. Don't you think it's worth a few dollars more to get a Grand Canyon Wide range of 6 Blues, Jazz, Metal, Surf, Country  plus the dozens of new and different pickup tones your stock guitar simply cannot produce? "The stock three tone selections are very limiting after installing your upgrade. I still have the stock three sounds but the extra three sounds are distinct and useful. I love having both pickups in series (and in-phase) giving me a very strong jazz-like tone, something you can't get out of a stock Telecaster. Hearing those additional two new intense and out-of-phase country twang tones (in both series and parallel version) gave me goosebumps. These glass-shattering tones will punch out windows at 30 paces. The download documents have detail more extensive than any other products that I have seen. Very well done!"  Graham Mann (Australia). You re-attach the upgrade and start exploring the 6 pickup tones now available to you. One standard Telecaster Upgrade with our T2-Switch and VT-2 Volume-Tone Control. 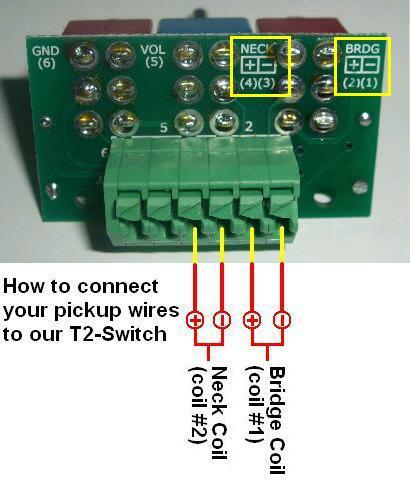 You connect your pickup wires to the green solderless terminal strip and connect the two marked upgrade wires to your output jack wires.